We are approaching the time of the year when people will pull out their wallets and start doing some serious shopping. They want to find the perfect gift for everybody on their list and they put so much effort into searching and buying the product, they want to make sure that they wrap it properly as well. It really adds to the occasion and helps to make it special when you are able to wrap something to perfection. In fact, you might be surprised to find out that almost $3.2 billion is spent on wrapping paper and gift bags every year in the United States alone! Obviously, customers want their gifts to look amazing. If you are somebody that takes wrapping gifts seriously and want to add a personal touch this year, regardless of the occasion, you might want to consider some customized and personalized wrapping paper. It is now possible to buy the paper with your own face printed on it. It is a product that is offered by Prezzybox and it is possible to customize the paper, not only with your own face but with any face you choose. One idea is to print the face of the person that is receiving the gift or perhaps even include your pet’s face! All that is really necessary is to upload a good picture to the website and they will take it from there. You can include only your face or you can add a Santa hat if you plan on using the paper for Christmas gifts. You will end up paying about $23 for a 2-meter roll and that is more than what you would spend on a regular roll of wrapping paper. It is worth it to see the look on somebody’s face and sometimes, they like the paper so much that they don’t want to ruin it by ripping it open. If you want to get some of this paper, you will have to live in the UK but there may be some other options for those who live in the United States. 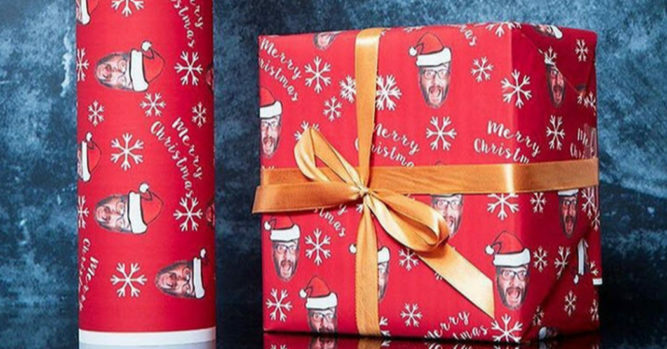 Zazzle offers an option for customized wrapping paper along with other companies, including Gift Wrap My Face, Minted and Personalization Mall. Personalizing your wrapping paper is a unique and enjoyable way to personalize the entire experience. You can also reveal your Secret Santa with such an option. Anybody who gets one of these gifts will know for a fact that you put a lot into it. After all, you put your face on it.